Nov. 10, 2018, 6:30 p.m. 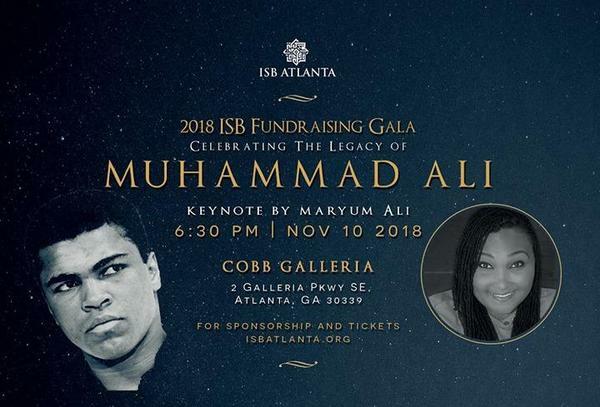 Please join the Islamic Speakers Bureau of Atlanta for the 2018 ISB Fundraising Gala on November 10, 2018 at the beautiful Cobb Galleria at 6:30 pm as we celebrate the legacy of Muhammad Ali. This will feature Muhammad Ali's daughter, Maryum Ali as the keynote speaker. Our Emcee for the Gala will be announced soon. The 2018 celebration will feature a networking reception followed by dinner and a keynote address. To learn more about the Gala and the ISB, please visit www.isbatlanta.org. Edit This Event Last Edited By: AtlantaMuslim.com Staff on Aug. 19, 2018, 10:06 a.m.